A Song for Sky Bells is a composition for power pole bells, Vietnamese zither dan tranh , Balinese flute suling , and Oceanian panpipes. Power pole bells are unique Australian instruments. They are galvanised iron caps made by the State Electricity Company of Victoria to fit on the top of electricity poles made from tree trunks of varying diameters. Their function was to protect the poles from the weather and for mounting insulators above the poles. Since 1996, Australian composer Anne Norman has been collecting these bells for use as musical instruments and components of sound sculptures. When I first touched these bells, I had the impression that their richness of frequencies and harmonics was the result of years of absorbing waves of vibrations from the winds and electric cables under the Australian sky. This impression is musically realised by the interaction of sounds of the bells, the dan tranh and the wind instruments. Frequencies and pitches are transmitted from one instrument to another in the process of generating melodies and layers of music. A Song for Sky Bells is music generated from the power pole bells after years of absorbing sounds in silence. This project was supported by the Australian Government through the Australia Council, its arts funding and advisory body. Kim’s Song is a short 3 minute electro-acoustic radiophonic work commissioned by the ABC for their Earclip series in 2002. It was a response to their call for works embracing the theme of “This world My Time” I felt the future of Australia is so firmly in the hands of the children that I should consider them as source material to endorse a spirit of hope for the future. My choice to work with cross cultural children who live in very different minority communities was motivated by my concern with the depressing political racism we have seen in decisions concerning the boat people and refugees in recent years. I thought it would be interesting to work with the children from different groups Vietnamese and Aboriginal to see how they were also grappling with how to cross the enormous cultural differences that are side by side in Australia. The authentic voices in this piece are those of children whom I know and love. Kim (far right) is the daughter of Le Tuan Hung, a Melbourne university colleague and co-founder of the Back to Back zithers cross cultural ensemble. Her mother, the composer performer, Dang Kim Hien and I were collaborating on a work Inside Outside when this song was recorded as little Kim wanted so much to be part of our rehearsals. Hien decided the song didn’t belong in what we were designing at the time so this piece for little Kim was made separately. 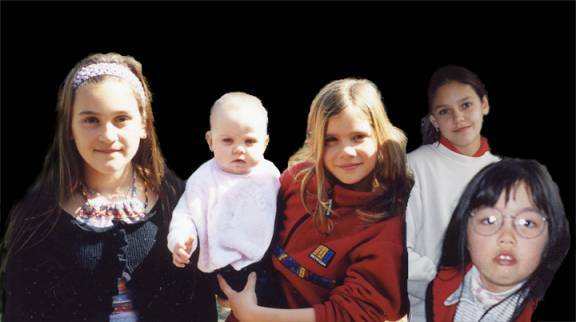 The aboriginal children are my partner’s grandchildren, Kara Rayner, and her cousins Casey and Renee Sweetman and their new sister, Aaliyah O’Brien. The voices were recorded at their own homes in Springvale and Glenroy respectively, and the children were delighted to be recorded in each case and found it very exciting to hear their own voices. Kim sang her Vietnamese song perfectly twice. Then her father sent me a recording of her singing Kookaburra sits in the old gum tree which he told me was her preferred song choice now that she had started school. In Glenroy, the cousins played games with each other and sang numerous playing and clapping songs over a period of an hour, running in and out, practicing and coming back in when they were ready. The simple stereo mike and DAT recording machine were not too obtrusive but still were objects which they wanted to touch, hold and listen to. Many minutes were spent under headphones by them all, even the baby. Back in my office with Pro Tools, I decided to enter all the recordings to see how compatible the sounds were and edit from there. Once in the machine, certain musical elements, timbre, pitch, loudness, density, phrasing and syntax directed my intuition, more than the content of the words they were singing. The texts of course were in different languages, Vietnamese, Aboriginal and English. Ý thiệt là vui ghê! The crocodile bails the water out! The bird startled by the sounds! Startled by the sounds, startled by the sounds, startled by the sounds! Inanay is a traditional Aboriginal song learned by the Sweetens at Koori school,in Shepparton. It was a song the teacher taught them from the Tiddas version. Their version of Inanay appears on the CD Sing About Life, 1993 ID Phonogram Recordings 1993 with thesummary traditional aboriginal song (Words not Available). The fact that it is being transmitted still by oral tradition in a non-scribal manner is noteworthy. A range of play songs were recorded showing the influence of television and the media as well as those from the schoolyard. Snippets of these appear at the end as well as the children’s laughter. Yet much greater than the texts was the vitality and energy of the children’s rendition. It was this that influenced me to choose one fragment over another, confirming my interest in non-verbal communication and extra-linguistic behaviours including body language. The element of communication was very evident in the aboriginal children’s play songs as they were communal, but it was also in little KIM. She sang quite vehemently, having a great sense of self and a very confident song knowledge, coupled with a marvellous performance energy for a four year-old. In working with the children, there seemed to be an overriding cultural agenda, the collapsing of cultural boundaries through sound. The mapping of the piece reflected this cultural intersection. Firstly, eachchild is looking at the world from a different place and cultural identity. For Kim it is represented by the Australian Song overtaking the Vietnamese song in the mix as the dominant culture is shaping her Vietnamese roots and traditions. For Casey and Renee, they have a living link through school to the cultural origins tho not the songs of their own family group. They were happy to share this song with their cousins in Melbourne and taught it to them, quite naturally during playtime in the backyard. Both aboriginal groups shared their common play songs from the Australian school yard. These can be heard at the end of the piece, especially the clapping song. It was decided to use a loop and treatment of the Inanay song as a landscape during the entire piece with respect for the aboriginal heritage of the land and ancient culture unto which we have all come. Several electronic effects, fades and treatments allow the materials to flow from one layer to another. The end result is summarised in the programme note. treated and designed into a three minute piece, the length being defined by the ABC.The piece was mixed on Pro Tools and engineered by Iain Mott. I would like to thank everyone for helpingthis piece to occur, the children, their supportive parents, the mixer, and the commissioner. Kim’s Song is dedicated to the children and all those working onthe ground for Australian culture which respects indigenous culture. It is they who determine the real future of Australia at this time. The Vietnamese is one of the relatively new groups of migrants in Australia. A significant proportion of Vietnamese Australians originally came as refugees between 1975 and the late 1980s. Since the late 1980s, most arrivals have been in the categories of family reunion and skilled immigration. By 2006, the Australian Bureau of Statistics reported that there were 194,854 Vietnamese in Australia (ABS 2006: Cat. No. 2068.0 – 2006 Census Tables). The largest Vietnamese communities are in Sydney and Melbourne, respectively (1996 Censor, McLennan 1999b: 85). Smaller communities are located in Brisbane, Adelaide and Perth. The smallest communities are in ACT, Hobart and Darwin. Within these communities, there exist many genres of music. These genres of music serve different social functions, including entertainment, expression of a political stand or viewpoint, expression and reinforcement of the Vietnamese cultural identity, or the creation of a divine religious atmosphere. Melbourne and Sydney have hosted the most vibrant activities of Vietnamese music in Australia. In general, Vietnamese musical activities in Australia present two major trends: (1) the preservation and cultivation of pre-existing music, and (2) the development of new music. Pre-existing music includes popular music, traditional music (folk music, classical music and Buddhist music), and Catholic Church music. New music includes folk fusion, world-jazz, popular music, experimental music, and art music written for Western instruments. Western-influenced popular music is the most dominant and accessible form of Vietnamese music in Australia. This genre of music, called tân nhạc [new music], has been cultivated, developed and flourished in Vietnam since the late 1930s. The development of this music coincided with the Westernisation of Vietnamese society in the early decades of the twentieth century. Throughout its development, Vietnamese popular music has continued to adopt and absorb newly developed styles and features from Western popular music. The adoption of the Western scale of temperament, meters, dance rhythms, popular song form (ABA) and tonal harmony. In many songs, especially those in the quê hương [homeland] style (see below), the vocal style remains basically Vietnamese with frequent use of ornaments such as vibratos and bent tones. Such vocal ornaments are not indicated in the printed music, which is in Western notation. They are added by singers in performances. This practice indicates that flexibility is an important aspect in the performance of Vietnamese popular music. This practice may have derived from traditional music, in which each performance of a piece is a realisation of a melodic framework (see 2.2.1. below). Therefore, any study of Vietnamese popular music should not rely solely on the printed versions or scores. The rock combo of electronic guitars, keyboard(s) and a drum kit is the standard format of the accompanying ensemble. A large number of songs employ Western and Latin dance rhythms in the accompaniment even though they were not initially written for social dances. Popular dance rhythms include Cuban bolero, tango, cha cha cha, rhumba, pasodoble, Boston and waltz. Disco and new wave are also found in popular music for young people. Western harmony and part-writing are typical in choral arrangements and performances of popular songs. 2.1.2. Styles of popular songs: There are three styles of popular songs: Western style, quê hương [homeland] style and tân cổ giao duyên [old and new music exchanging charms] style. Western style: based exclusively on Western pop and rock musical models. Quê hương [homeland] style: shows a combination of the features of Western pop music listed above and those of Vietnamese folk music. Pentatonic scales, melodic motives or fragments of folk songs were used to create folk-like pop songs. A few songs also show the adoption of the call and response structure of traditional work songs ho. One or more traditional instruments are often used in the accompaniment of these songs in addition to the rock combo. The most popular traditional instrument is the đàn tranh [zither]. Tân cổ giao duyên [old and new music exchanging charms] style is the fusion-song-style developed by Bảy Bá in Saigon in 1964. This song style has been very popular in South Vietnam since its creation. This style shows a combination of two pre-existing song styles: the traditional song Vọng Cổ [Longing for the Past] and the Western-influenced popular songs. Sections of existing popular songs (the New) are combined with those of the traditional song Vọng Cổ (the Old) to form a “piece” of music with sections alternating between traditional and styles. The traditional sections are accompanied by Vietnamese instruments and the pop sections are accompanied by Western instruments. The most popular instrument used in the accompaniment of the traditional sections is the modified Western guitar, with a wavery fingerboard that enables the musician to producing the bending tones typical of Vietnamese music. The main functions of popular music are (1) entertainment and (2) propagation of patriotism and nationalism or a political stand. Popular music as entertainment has always been a dominant element in the musical activities of Vietnamese Australians. This has been explicit in almost every social and cultural activity in the community. Popular music is the main form of music played and listened to at homes, restaurants, café, and nightclubs. Most Vietnamese weddings in Australia have a live pop band as part of the entertainment. Pop music in karaoke format is a very popular form of entertainment at homes and some restaurants. Commercial presentations of popular music have often been organised by entrepreneurs in the form of đại nhạc hội [literally meaning ‘grand musical gathering’]. It is in fact a variety show in medium to large venues such as Collingwood Town Hall, Dallas Brooks Hall and Melbourne Concert Hall in Melbourne. Most of these big shows are often organised in conjunction with one or more smaller shows at nightclubs. These events often feature Vietnamese pop stars from the United States, where a robust Vietnamese popular music industry has been flourishing since the 1980s. A large portion of CDs, DVDs, VCDs and videos of popular music consuming by the Vietnamese Australians comes from the United States and Vietnam. At community events or celebrations such as tết [New Year festival], tết trung thu [mid-Autumn festival which is a children’s festival], and Giỗ tổ Hùng Vương [King Hung Commemoration Day], entertainment is always featured in the form of a variety show with pop music, folk music (traditional and/or Westernised), and contemporary stage dances. Popular music always dominates these programs. In the 1990s and early 2000s, a number of chamber choirs such as the Melbourne-based Hương Xưa, Giao Chỉ and Ðàn Chim Việt had been active in the presentation of choral arrangements of Vietnamese popular songs. These groups had presented annual performances for the community and participated in various multicultural events. A majority of Vietnamese popular songs are love songs. Other songs deal with a variety of topics such as homeland of the past, mothers’ love, meditation, etc. Between the late 1970s and mid-1980s, songs with patriotic or political lyrics had also been popular. The rise of many nationalist movements among the overseas Vietnamese had been a significant motivation for the development and popularisation of this type of political songs. The corpus of these songs include those created by nationalist songwriters in Vietnam since the 1940s, propaganda songs created by the former South Vietnamese government (1956-1975), and political songs written by Vietnamese songwriters living in the United States, France and Australia. 2.2. Traditional music: A variety of genres of Vietnamese traditional music have been preserved and transplanted in Australia. They include folk music, classical chamber music and theatrical music. Melodies are based on modes, with pentatonic modes being most common. Each mode is defined by tonal material, specific tonal and microtonal ornaments for each pitch level, and melodic motives and contours. Melodies show frequent use of bending tones (a main tone followed by tonal and/or microtonal glissando ornaments. Pitches in authentic traditional music are from an quasi equi-distant seven-tone scale. Duple, quadruple and free metres are common. Typical texture of multi-part music is heterophonic texture. The exception is in sung poetry ngâm thơ, where the texture is polyphonic. The performance of a piece is a process of elaborating a skeletal melody. The đàn tranh is a zither, similar to the Japanese koto and the Chinese zheng. The standard version of this instrument has seventeen strings. Larger đàn tranh of twenty-two and twenty-five strings are also used in works of the Melbourne-based composer-performer Ðặng Kim Hiền. The đàn nguyệt (or đàn kìm) is a two-stringed moon-shaped lute. It has a long fingerboard with very high frets. The đàn bầu (or đàn độc huyền) is a monochord. The đàn nhị (or đàn cò) is a two-stringed fiddle with a tube resonator. The đàn tỳ bà is a four-stringed pear shaped lute, similar to the Chinese pipa. The sáo is a bamboo or wooden transverse flute. A variety of percussion instruments, including sinh tiền [coin clappers], phách [clappers], song lang [foot clapper] and drums. In the music-theatre cải lương, the modified Western electronic guitar with a wavy shaped fingerboard appears to be the popular instrument. Folk music: Folk songs of various types, including ru [lullabies], lý [village songs] and hò [work songs] have been maintained by a number of Vietnamese musicians and non-musicians. Authentic songs are either unaccompanied or accompanied by percussion only. Urbanised folk songs which have been popular on stages in Vietnam since the late 1950s are accompanied by traditional melodic instruments. Westernised folk songs which first appeared in Vietnam in the 1960s are characterised by the lack of traditional tonal and microtonal ornaments, the use of pitches from the scale of temperament, and the adoption of Western harmony and instruments in the accompaniment. Authentic folk songs are mainly sung by a number of elderly persons and a few traditional musicians. Urbanised folk songs are performed by both traditional and pop musicians. Westernised folk songs are performed mostly by pop singers, youth choirs, chamber choirs, and younger members of the community. A number of Vietnamese choirs in Sydney and Melbourne also perform folk songs arranged for three or four parts, using Western harmony and part writing approach. The Melbourne-based choral group Giao Chỉ had been very active in this area in the late 1990s and early 2000s. Classical chamber music: Two genres of classical chamber music, the nhạc Huế [Huế music] and the nhạc tài tử [music for talented artists], have been preserved by a small number of musicians, mostly based in Melbourne and Sydney. These two genres of music have flourished in Central and South Vietnam since the 17th and the 19th centuries, respectively. Regarding musical features, they are closely related in concepts of modes, musical structure and instrumentation. Their repertory consists of pieces in different modes that are designed to express or evoke different emotions such as sadness, happiness, and tranquility. Each piece is a melodic framework and the instrumentation of realised versions is flexible. A piece can be realised as (1) a solo song with one or more accompaniment instruments, or (2) as a solo or ensemble instrumental piece. Sung poetry ngâm thơ: Ngâm thơ is the art of chanting or singing Vietnamese poems. Originally, it was a folk art form that has been incorporated into various forms of traditional theatre and has established itself as an urban chamber art form in Vietnam since the 1950s. The performance of ngâm thơ is a process of collective improvisation on one or more specific modes. A vocalist is accompanied by one or more melodic instruments. The music is in free meter. The texture is made up of independent lines that coincide at the same pitch level at the end of most poetic lines. Musical theatre: The South Vietnamese music drama cải lương is the only form of music-theatre maintained by the Vietnamese Australians. This theatrical form combines spoken dialogues, chanted poetry, excerpts of nhạc tài tử, the Vọng Cổ song [a traditional song based on the musical principles of nhạc tài tử], short pieces based on the principles of nhạc tài tử, folk songs, Chinese theatrical songs and Western styled popular songs. A number of amateur groups in Melbourne and Sydney such as the Hoa Tình Thương, Lạc Hồng,and Hoài Hương perform cải lương at the Vietnamese New Year Festival and a number of charity events. The VN Richmond House Restaurant (Richmond, Victoria) has also featured regular performances of excerpts of well-known cải lương by local artists. In the 1990s, commercial performances in collaboration with Vietnamese cải lương stars from Europe and the United States have attracted huge audiences. Cải lương video and sound recordings produced by professional troupes in Vietnam are also popular among the Vietnamese Australians, especially the middle age and the elderly. Buddhist chants form an essential part of the religious liturgy in Vietnamese Buddhist temples in Australia. These are either metric or non-metric chants recited with or with out the accompaniment of a temple wood block and bells. The modes of these chants are closely related to those in Vietnamese classical and folk music. Apart from the Buddhist chants which form part of the religious services in temples, all other genres of traditional music have two main functions: (1) entertainment and (2) reinforcement or expression of the Vietnamese cultural identity. Within the Vietnamese community, traditional music performances have been rare. Concerts with exclusive traditional items are extremely rare. Traditional music only appears as single items of a variety program in community events. There are two main reasons for this low level of activities of traditional music. First, there are few competent traditional musicians in Australia. Second, traditional music has been replaced by popular music as the dominating form of entertainment in Vietnam for many decades. Therefore, the low level of activities of traditional music in Australia is only a continuity of the socio-musical characteristic of Vietnamese musical taste that has been formulated in Vietnam. It is in musical events out side the Vietnamese community that traditional music has been performed in greater frequencies. Performances of exclusive traditional items have been featured at music festivals, folk festivals, world music venues and in many radio programs. Many multicultural and community events also feature Vietnamese music as part of a program of world music. Recordings of Vietnamese traditional music in Australia have also been produced mainly non-Vietnamese labels such as ABC, Move, and Mabuhay Records. Music of the Vietnamese Catholic Church in Australia shows the preservation and cultivation of the pre-existing styles and forms of church music in Vietnam. This music is modelled on European church music and is fundamentally built on Western concepts of music. The repertory includes choral music with or without instrumental accompaniment. Father Văn Chi (Sydney) is well-known for his corpus of several original choral works for the Vietnamese Catholic community. 3. The Development of new music: While the main trend in popular and traditional music has been the preservation of pre-existing styles and forms, the main trend in contemporary music has been the creation of new music. New music by Vietnamese Australian composers can be classified into five categories: (1) New compositions for Western instruments, (2) experimental music, (3) fusion music, (4) art songs and (5) new popular music. 3.1. New compositions for Western instruments: A number of Vietnamese composers have created original works for Western instruments. Composer-guitarists Hoàng Ngọc Tuấn and Nguyễn Lê Tuyên (Le-Tuyen Nguyen) have enriched the repertoire of the classical guitar with many new solo works. Both Hoàng Ngọc Tuấn and Nguyễn Lê Tuyên have made significant contributions to the extension of the guitar’s playing technique. Hoàng Ngọc Tuấn developed several unique tuning systems for his works based on Vietnamese musical modes. Nguyễn Lê Tuyên invented the technique of producing staccato-harmonic duo-tone on the guitar. Staccato-harmonic duo-tone is the simultaneous sounding of two tones on one string of the guitar. Each tone has its own definite pitch, duration, articulation and distinctive tone colour. The lower tone has the normal staccato tone colour with shorter duration; the higher tone has the natural harmonic bell-like tone colour with longer duration. This new sound and technique were first employed in Nguyễn’s guitar works Nocturne (1996) and Fantasia (1998). Another trend in new music by Australian Vietnamese composers is the creation of a touch of Vietnamese colour in their work by using folk melodies, modes or rhythmic structures. Examples of such compositions are Memories of Highlands (1984), Full Moon Festival (1984) for classical guitar and Vietnamese Dance Suite (1991) for woodwind, brass and percussion by Hoàng Ngọc Tuấn, String Waves (1990) for violin and string orchestra, Melorhythm (1993) for 13 violins and 2 cellos and Water Ways (1996) for woodwind, brass and percussion by Lê Tuấn Hùng. These works are performed by Australian performers at main stream events, and may be regarded as new Australian music rather than ‘Vietnamese music’. Since the 1980s a number of Vietnamese composer-performers have been active in Australian experimental music. The first experimentalists are Lê Thị Kim, Hoàng Ngọc Tuấn, Ðặng Kim Hiền and Lê Tuấn Hùng. Three of these musicians are traditional instrument players. This explains the frequent use of traditional instruments in their new music. Experimental music by Vietnamese Australian composers is characterised by (1) the exploration of old and new possibilities of sound making on the Vietnamese traditional instruments, especially the đàn tranh and the đàn bầu (2) the experimental combination of the Vietnamese and non-Vietnamese instrument(s), and/or non-conventional sound-generating devices, and (3) a high level of flexibility in performance. 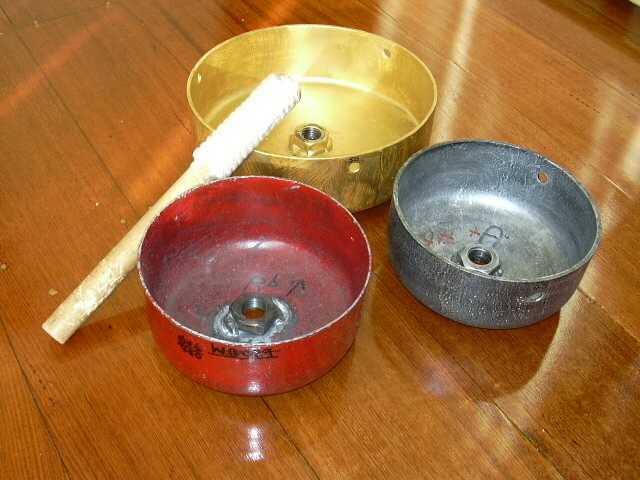 In these works, traditional playing techniques are used in conjunction with new techniques exploring unconventional sounds on Vietnamese instruments. In the late 1980s and early 1990s, Lê Thị Kim’s and Lê Tuấn Hùng’s works in collaboration with Ros Bandt and Kari in the Back to Back Zithers explored a number of techniques such as gliding a glass on the strings after plucking, dropping wooden items on the strings, plucking various parts of the strings, preparing the strings by stretching a rubber band across them, blowing into the sound-hole, taping on the soundboard of the instrument, or placing vibrating chopsticks between the strings. Both traditional and unconventional tunings are used in the music of the Back to Back Zithers. Spring (1991) for four prepared zithers and slide whistles by Lê Tuấn Hùng in collaboration with the Back to Back Zithers is one of the examples of this technical exploration. In her piece Paper and Strings (1991), Lê Thị Kim created very subtle and delicate sound effects and melodies on the đàn tranh by throwing paper balls on the strings, and bowing and plucking the strings with a thin strip of paper. Hoàng Ngọc Tuấn introduced a wide range of sound effects and colours on the đàn tranh in his music for theatres such as Lotus War (1995) and Conversations with Charlie (1996). In these works, the đàn tranh was bowed either with a conventional violin bow or a strip of sandpaper, tapped, beat, or played with guitar techniques such rasguedo. Hoàng Ngọc Tuấn also experimented with tuning the three octaves of the đàn tranh in three different scales. In her piece On a Quivering String (2005), Ðặng Kim Hiền introduced many new playing techniques to expand the colour pallet and dynamics of sounds of the đàn bầu: The tapping of the string or the beating of the vòi đàn [the stick that holds the string of the instrument] with the palm enables the player to generate a whole range of sounds and dynamic levels which are not previously possible on the traditional instrument. Regarding instrumentation, many works by the above composers show experimental combinations of Vietnamese instruments with a variety of instruments and sound-making devises. Spring (1991) and Reflections (1990) by Lê Tuấn Hùng, are for two đàn tranh, a Medieval psaltery and a Indonesian kacapi. Pond (1991) by the Back To Back Zithers features a Renaissance flute and two đàn tranh. Soul of the Wind (1993) by Lê Tuấn Hùng is for a đàn tranh, a suling [Indonesian end-blown flute] and tape. Calm Water (1996) by Lê Tuấn Hùng is for two đàn tranh, a Balinese suling [end-blown flute] and electronic crickets. Longing for the Winds (1996) by Lê Tuấn Hùng is for harmonic voice, đàn tranh, đàn nguyệt, Vietnamese percussion and tape. Webs of Life (1996), an audio-visual work by Ðặng Kim Hiền, and Lê Tuấn Hùng, combines the đàn tranh, đàn nguyệt, and đàn bầu with various non-Vietnamese instruments, original instruments, voice and tape. Inside Outside (2002) by Ðặng Kim Hiền and Ros Bandt was created for voice, đàn tranh, Vietnamese percussion, recorder and viola da gamba. Melodia Nostalgica (2005?) by Ðặng Kim Hiền feature an electric dan bau, a piano and recorded sounds of a flock of birds. Lotus War and Conversations with Charlie by Hoàng Ngọc Tuấn also combine the đàn tranh with various Western, non-Western instruments and tape. In the music created for the theatrical work Soft Silk… Rough Linen, Hoàng Ngọc Tuấn combined voices with a đàn bầu, a đàn xến [lute], flute, clarinet, violin, cello and percussion. Lê Tuấn Hùng’s electro-acoustic works such as A Song for Sky Bells (2004), Elegy (2005), Mantra for the Seeds of Love (2006), Journey to the Light (2007), or A Time to Celebrate (2009) shows the combination of musical sounds from both traditional, and non-traditional instruments and devices. Textures of two or more layers of sounds are typical for many of these compositions. Some of the compositions explore traditional modes of Vietnamese and non-Vietnamese music, while others advent the sound scapes of atonality, microtones, sound masses and noises. Most of the experimental compositions were written in graphic or skeletal notation to allow a high level of flexibility and spontaneity in the performing process. Improvisation is therefore an integral part of performances. It was the experimental spirit, the desire to explore and break down boundaries of sounds, the need for new sounds to express contemporary ideas and feelings, and interest in post-modernism that motivated the creation of these compositions. These works belong to the experimental stream of music in the host society rather than the contemporary stream of Vietnamese music. They are featured mainly at concerts of experimental music, theatrical performances, and music festivals organised by and for non-Vietnamese. In the 1980s and 1990s, a number of Vietnamese musicians have been involved in the making of fusion music in Australia. Their repertory includes arrangements of Vietnamese and non-Vietnamese folk melodies, new folk-like compositions based on Vietnamese and non-Vietnamese musical aspects, and improvisation. Their performances combine Vietnamese with non-Vietnamese instruments. The Adelaide-based Bamboo Ochre ensemble combines Vietnamese instruments such as the đàn tranh, đàn bầu, and sáo with non-Vietnamese instruments such as the bass guitar, electronic keyboard and Indian tabla. The music of this ensemble combines material from Vietnamese, Chinese, Indian and Western pop music. Members of this ensemble include both Vietnamese (Nguyễn Ðăng Thảo and Phan Văn Hưng) and non-Vietnamese musicians. Nguyễn Ðăng Thảo was also a member of other multicultural ensembles, and has composed music for many theatrical projects. In the field of world-jazz, Melbourne-based multi-instrumentalist Nguyễn Anh Dũng (Dung Nguyen) has been one of the key elements for the success of the band Way Out West. This band features Peter Knight (trumpet), Nguyễn Anh Dũng (đàn tranh, đàn bầu, đàn kìm, and modified electric guitar), Ray Pereira (percussion), Rajiv Jayaweera (drums), Paul Williamson (saxophones), and Howard Cairns (acoustic bass). Way Out West was the winner of the 2009 Bell Award for Best Australian Jazz Ensemble. The band has performed at jazz festivals worldwide and their CDs have received critical acclaims in Australia and Canada. The popularisation of world music, the growing interest in non-Western music and cross-culturalism among a number of Western musicians, and the emergence of a more friendly cultural environment in host societies in recent decades (e.g. multiculturalism in Australia and Canada, support for ethnic arts and music in the United States, etc.) are among the main motivations for the development of folk fusion music. Various folk fusion and cross-cultural ensembles exist in countries like Australia, Canada and the United States. The involvement of Vietnamese musicians in this musical trend represents the Vietnamese participation in musical activities of host societies and the desire to make their cultural heritage part of the musical fabric of their new homeland. Sydney-based composers Hoàng Ngọc Tuấn and Phạm Quang Tuấn have created many art songs and song cycles. Many of these works are for solo voice and classical guitar. These artistically crafted songs represent a new trend in Vietnamese contemporary music. While a number of Vietnamese of the first generation such as Phan Văn Hưng, Phạm Quang Ngọc, and Thụy Phong composed new songs to propagate within the Vietnamese communities, it was the new generation of Vietnamese musicians and song-writers who have begun to make their marks in Australian music scenes. After thirty-five years of Vietnamese settlement in Australia, a new generation of Vietnamese Australian artists have been born, grew up and professionally trained n Australia. For these new popular musicians, main stream Australian and international music scenes are their playgrounds. In recent years, a number of Vietnamese Australian musicians have emerged in Australia. Thanh Bui, who reached the top 10 of the Australian Idol in 2008, is a well-known case. Being a talent vocalist and instrumentalist, Thanh and his North band has been well-received and had top ten hits in Thailand, Indonesia, Malaysia, the Philippines and India. They released two albums (North (Universal, 2004) and Straight Up (EMI, 2006)) before split up in 2006. Thanh has has also penned many new songs. A number of his songs are in chart-topping albums in Japan and Korea, and Germany. Best examples are his Killer Queen for Jimi Blue (gold in Germany) and Dream Alive for Arashi (number 1 in Japan). His self-titled EP which features five original songs (Broken, Heart Beat, Happy Birthday, I’m Forbidden,and No) was released in 2010. Socially, there is a strong tendency among Vietnamese traditional musicians in Australia to turn from professionalism to semi-professionalism or non-professionalism. Indeed, despite the steady growth of their community, the range and frequency of activities of traditional music within the community have not yet been sufficient to enable musicians to rely solely on music making as a profession. In addition, opportunities for participation in musical activities outside their ethnic community are also limited in the host society. As a result, the majority of Vietnamese traditional musicians have to make a living fully or partly in another profession. This has been an important factor behind the relative lack of musical creation or innovation in music for traditional instruments performed within Vietnamese communities. All significant musical changes and innovations are introduced by musicians who are regularly involved in musical activities outside their ethnic community. In fact, a few traditional musicians have expanded their musical skills and expertise to other fields of music, including jazz, pop music, music for non-traditional theatre, film music, folk fusion music, and experimental music in order to enhance their employability. 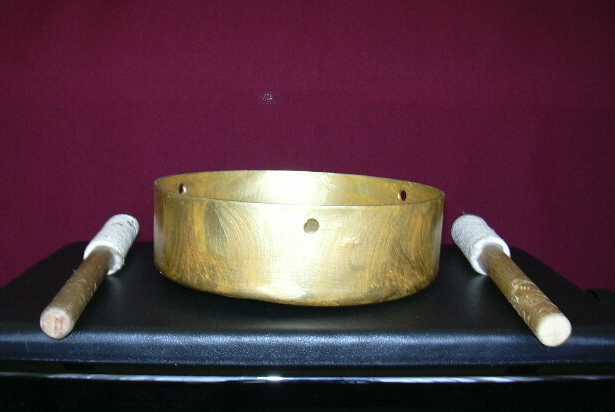 This has led to a number of innovations in terms of musical styles and forms as described above. For many musicians who have been trained professionally in Australia, teaching at schools and/or at private classes is the main employment options. A number of these artists have also been active in various mainstream activities such as concerts, music festivals, cabarets, and musicals. They are an integral part of the bigger Australian musical scene. A number of Vietnamese musicians, such as pianist Hoang Pham, guitarist Minh Le Hoang (Lê Hoàng Minh), multi-instrumentalist Nguyễn Anh Dũng (Dung Nguyen) and singer-songwriter Thanh Bùi have been successful in their artistic paths. Within the community, pop musicians appear to fare much better than traditional musicians. As the demand for their performance is higher and more frequent, a number of musicians can make a living with their music and related activities such as teaching, recording or hiring sound systems. A few competent musicians, such as Tùng Châu and Nguyễn Anh Dũng, have been involved in the Vietnamese popular music production “Paris by Night” in the United States. In Australia, the competition for works is high. For examples, there are more than twelve pop bands that place advertisements regularly in Vietnamese newspapers and magazines in Melbourne. These bands have to compete with each other to obtain works mainly in private parties and weddings within the community. Out side the community, their music is virtually unknown. Apart from the pop bands, a majority of performers of Vietnamese pop music in Australia carrying out their activities on non-payment basis, even though their standard of playing may be the same as those who work professionally. The reason is that many of these performers are qualified professionals in other disciplines (i.e. medicine, law, education or IT) and their professions have been well regarded in the community. It was their choice to make their art a hobby rather than a profession. Regarding music education, traditional music training has been offered in private or in community classes. The Trường Âm Nhạc Dân Tộc [School of National Music] (Sydney) is the largest community class of traditional music in Australia. This school offers classes in various Vietnamese instruments and musical genres. However, it is noticeable that there are not many young Vietnamese Australians who are interested in learning Vietnamese traditional music. The number of young people who learn Vietnamese instruments have decreased significantly over the years. In contrast, interest in Western pop music and classical music is very high, and private teachers always have many students. The fact that many Vietnamese Australian parents regarding playing Western classical music as a symbol of “social prestige” plays an important part in the shaping of Vietnamese music education in Australia. In the last few decades, the number of Vietnamese children learn to play Western instruments and classical music, especially piano, has been steadily increased. This trend has been supported by a growing number of private music tuition and music shops within the community. Between 1975 and 2010 two major trends in Vietnamese music in Australia are: (1) the preservation and cultivation of pre-existing music, and (2) the development of new music. Musical activities within the Vietnamese communities appear to focus on pre-existing forms and styles of music. All social and cultural indicators suggest that pop music will continue to be the primary and prevailing form of music within the Vietnamese community in Australia in the years to come. Traditional music which has existed mainly in preserved form would loose its popularity among the younger Vietnamese of the second and third generations. The lack of competent musicians in the community will be a decisive factor for the survival of Vietnamese traditional music in Australia in the future. All significant musical changes and innovations have been developed by musicians who are regularly involved in musical activities outside their ethnic community. Their new music has been created for a primarily non-Vietnamese Australian audience, and therefore, will become a part of the contemporary musical fabrics of Australia rather than a new trend of Vietnamese music. Le Tuan Hung. 2003. “Vietnamese Traditions” in Currency Companion to Music and Dance in Australia. General editors: John Whiteoak and Aline Scott-Maxwell. Sydney: Currency House in association with Currency Press, pp. 678-680. Le Tuan Hung. 1998. Dan Tranh Music of Vietnam: Traditions and Innovations. Tokyo, Melbourne: Australia Asia Foundation. Le Tuan Hung. 1997. “Vietnamese Music” in The Oxford Companion to Australian Music. Edited by Warren Bebbington. Melbourne: Oxford University Press, p. 571. Le Tuan Hung.1995. “Popular music of Vietnam” in Music and Popular Culture: Asia and Australia : Unit Study Guide. Clayton, Vic. : Monash Open Learning, p. 101-108. Marcellino, Raffaele. 2003. “Postmodernism in Music” in Currency Companion to Music and Dance in Australia. General editors: John Whiteoak and Aline Scott-Maxwell. Sydney: Currency House in association with Currency Press, pp.542-544. Dang Kim Hien. 1998. Shadows of the War Horse. For đàn tranh [Vietnamese zither] solo. Melbourne: Australia Asia Foundation. Dang Kim Hien & Ros Bandt. 2002. Inside Outside. For voice, đàn tranh, recorder, viola da gamba and percussion. Melbourne: Australia Asia Foundation. Nguyễn Ðăng Thảo. 1998. Thiếu Phụ Nam Xương [The Lady of Nam Xương]. A musical for the Vietnamese youth choir Giao Chỉ. Manuscript. Văn Chi. 1996a. Trầm Khúc Hoan Ca. Tập 13. Sydney: Combined Choirs’ Association of St. Lê Bảo Tịnh. Văn Chi. 1996b. Trầm Khúc Hoan Ca. Tập 14. Sydney: Dân Chúa. The Effects of Weather. Performer: Way Out West. One CD. Jazzhead (2010). World jazz. Fractions of Illumination: Cross-cultural Music by Australian Women Composers. Various artists. One CD. Sonic Gallery, SG0901 (2009). Original compositions. Music Deli in the Can: Folk and Traditional Music from Many Cultures of Australia.. One CD. ABC Music 512 102-2 (1992). Traditional music. North. Performer: North band. One CD. Universal (2004). Popular music. On the Wings of a Butterfly. Various artists. Once CD. Move Records, MD 3297 (2005). Ơn Cha Nghĩa Mẹ Tình Quê [For Mother, Father and Homeland]. Performers: Minh Ha, Tran Khuong and Dang Kim Hien. One CD. Minh Hà (2003). Sung poetry. Phương Trời Nam [The Southern Sky]. One CD. Association of Vietnamese Students in Victoria [1998?]. Popular music. Quivering String. Composer-performers: Ros Bandt, Kari, Le Thi Kim and Le Tuan Hung. One CD. Move Records. MD 3141 (1992). Original compositions. Scent of Time : Australian Compositions for Asian Instruments and Voices. Various artists. One CD. Move Records, MD 3263 (2002). Original compositions. Straight Up. Performer: North band. One CD. EMI Malaysia (2006). Popular music. Thiếu Phụ Nam Xương [The Lady of Nam Xương]. A Vietnamese musical performed by members of the Giao Chỉ Choir. Produced by Giao Chỉ Choir. 2000. Tùng Châu: võ sĩ, robot hay nghệ sĩ? This article is an abridged version of chapter 5 of the book Chinese Music in Australia by Wang Zheng Ting. the period from 1949 to the present, especially in the years from the late 1980s. established in the early 1980s, and the Australian Chinese Music Ensemble. three groups are representative of the development of organised Chinese music in the period from 1949. The Gangzhou Society Cantonese Opera Group was established in Melbourne in 1960.
came to Australia were sponsored by Chinese businessmen to work as labourers. Many, therefore, had no education, nor did they have a good understanding of English. Community, which similarly limited their social activities within the Chinese society. the overt manner in which gambling had taken hold in the Chinese community. Ziwanyizuozhianchen came to Melbourne approximately once every three months. Cantonese Opera Group were of both Chinese and Western origin. like the full moon), saxophone, violin, Hawaiian guitar, and percussion instruments. Even a xylophone was used. included: Birongtanjian, Wangbaochuan, Yibacunzhongjian and Yiqufengqiuhuang. reinvolved with their families, resulting in less time for their involvement in opera. ‘White Australia’ had ever seen. opportunities to express Cantonese opera skills. established in the Gangzhou Society with the assistance of Huang Zhaonan. Chinese community know it as Cantonese opera attached to the Gangzhou Society. Cantonese Opera Group, to identify this opera association. Bourke Street on the 1st floor, in the location of the See-Yap Society (Shiyi Huiguan). The members of the opera seem to enjoy their activities in this non-profit organisation. musicians would play different parts from an organised score. Western people have been able to experience Chinese culture. Chinese Unity (The Boite, :20). New Asian Chinese immigrants provided extra potential new members for the orchestra. Singapore, Mainland China, Chinese-Australians, and even some Anglo-Australians. bass, plus various Chinese percussion instruments. had a permanent place for rehearsals (Interview: Stephen Wu, 22nd December 1994). increased to approximately thirty’ (Interview with Gary Chen, 22nd December 1994). In some circumstances, a nuclear group of 5 or 6 will play on behalf on the orchestra. the orchestra vary widely. These problems greatly hinder the progress of the orchestra. pieces, as Stephen Wu pointed out, was determined by the standard of the orchestra. (Interview: Stephen Wu, 22nd December 1994). Cai Chunsheng and Shen Pangeng have conducted the orchestra. Coach, and an Algerian piece, Taimu-Taimu. Peter is an Australian. His involvement with the orchestra came about by accident. (Interview: Peter Bannister, 22nd December 1994). more about Chinese culture, Peter thought he should make more Chinese friends. learning the sheng [mouth organ]. different cultures, and that there is an advantage in cultural exchange. (Interview: Grace Gorman, 22nd December 1994). her colleagues with an opportunity to become further interested in Chinese culture. Chinese culture, and that these people in turn can influence others. its doors to the West. personal contacts and social activities with friends. provided the ensemble with the opportunity to appear frequently on media programs. Trading and Business Affairs in Melbourne. Music Deli. The first recording with Music Deli was on the 17th of August 1989.
from Stephen Snelleman, 21st August 1989, to the International Language Centre). Festival and the Piccolo Spoleto, further promoting the profile of the ensemble. graduate from Xian Conservatory of Music, performs with the ensemble. musicians in the ensemble have more freedom for improvisation and ornamentation. exquisite style, which is a distinguishing feature of Jiangnan style. music and adopted foreign music. in some of his interpretations of musical pieces. decoration, the Chinese aspects of the piece were reinforced. orientation towards an amalgamation of Western and Eastern musical aspects. professional purposes, payments usually follow the rates of the Musicians Union. valuable aid to the ensemble in the past. possible devaluation of the professional reputation of the ensemble. contract with Event Enterprises for promotion and performances throughout 1995. Sydney, they played at the Australia National University in Canberra. these performances and more than 95% were estimated to be of Anglosaxon origins. orchestras in Australia, at first was mainly influenced by musicians from Hong Kong. interested in Chinese culture has been greatly enhanced.